The Highest Quality, Industrial Grade, Affordable Garage Floors in the State. Search Your Address to See What Homes have a Beautiful New Mexico Garage Floor Near You! Locally owned and operated, New Mexico Garage Floors has a combined 17 years’ experience with providing clients with the highest-quality, industrial-grade, affordable and most beautiful garage floors in the state. Our team has serviced over 1,100 unique floors resulting in over 1,100 happy clients. Thank you very much for the great job. I appreciate your professionalism and timeliness, and like my floor1 I am moving my shop into this building and preparing the old one for your next job for me. All I can say is WOW- my floor is absolutely amazing and fabulous. It looks great, but more importantly it is virtually indestructible. I actually dropped a huge glob of paint on the floor, and it just wiped right off. Also, my snow covered, dirty car left black spots that simply wiped off as well. We decided on NM Garage floors after getting a couple of quotes. tim and his team were prompt and professional. they used a new clear epoxy product on the floor and part of it developed pock marks. tim came out to look and then worked around our crazy schedules to get back out to our place and fix the pock-marked section of the floor – no problems! the floor is gorgeous and indestructible and we are so glad we did this. we highly recommend tim and his team!! Tim’s professional team did us a fantastic job that has turned out great. I can now easily keep my garage and shop floor clean. My 60 year old garage floor had a heavy mastic load from an original tile covering. I knew that I would never be able to remove that gunk and end up with a clean enough surface to epoxy. After interviewing two other contractors whose proposed solutions didn’t meet that basic need, I called NM Garage Floors, Tim convinced me that his grinders would do the job and that is exactly what happened. A couple months later, my hot water heater failed (it was located in the garage). I replaced it with a tankless system mounted on the wall which left the spot where the tank had been glaringly unfinished. I called and Tim put me on his schedule. They came over, cleaned and epoxied that space then took the time to look around for touch-ups and even repaired a new crack that had just shown up. 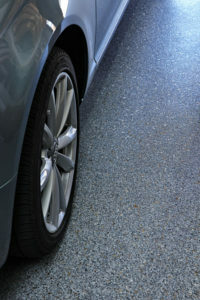 You will do well to have NM Garage Floors on your project–you’ll be happy with the result. Tim and his team did a fabulous job on our garage floors and our outdoor patios. They delivered exactly what we were looking floor and were true professionals throughout the entire process. n September, 2015, I decided to finally finish the 3-car garage that came with my house which I had built in 2011. I hired a general contractor to do the work. As part of the job, I wanted to have my garage floor epoxy-coated. The general contractor was going to do the floor coating himself, using department-store, off-the-shelf epoxies. He and I quickly came to the realization that he would not be able to give me a floor that would live up to my aesthetic and durability standards. So, I did some searching on the internet and came across NM Garage Floors. I called the number listed on a Saturday and not only had my call answered, but had a visit the next day, on a SUNDAY, from Tim, the owner. He showed up at my house exactly when he said he would (which, as you know, is pure gold when working with contractors), and described his flooring process to me. I knew right away that I had made the right choice in choosing NM Garage Floors to do the job. My uncoated cement floor had been exposed to four years of dirt and oil, and had cracked and chipped in several places. Tim’s process involves meticulous preparation of the underlying floor to make sure that the epoxy will stick permanently. He also uses a hygrometer to make sure there is not an unacceptable amount of moisture permeating into the cement from the soil underneath. Everything Tim does with his floors is done to ensure durability. His hope is that you will only ever need one epoxy floor – the one he applies for you. As far as the looks of the floor, well, words can’t really describe it. 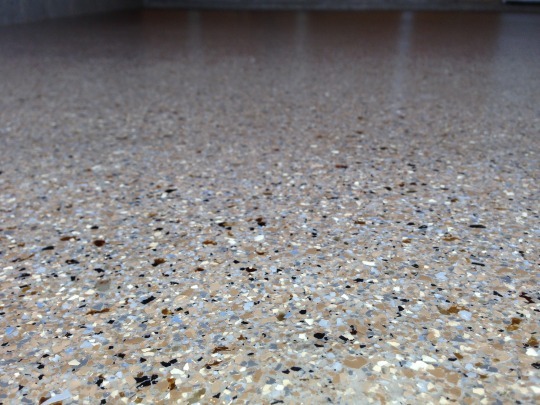 Tim uses a dense application of mica and latex chips in his higher-end floors with 100% coverage, which gives the floor a very classy, upscale look. It also gives the floor an effective non-slip characteristic. The clear urethane coat he uses on top is incredibly durable and still shines beautifully after a quick mopping, even after a year of heavy foot and vehicle traffic. I really cannot say enough great things about this company or the work Tim does. He even recently repaired a gouge that a delivery person put into my floor with a pallet jack. Unless I pointed it out to you, you’d never know it was damaged in the first place. And that, really, is the icing on the cake: If you get a floor from Tim, not only are you getting an incredible epoxy floor for your garage, but you are also getting a commitment from him to provide the support you may (but hopefully, won’t) need months or even years down the line. I highly recommend this business. Believe me, unless you REALLY know what you’re doing, don’t try to do an epoxy floor yourself. You’ll just be doing it again down the line. Get it done once, and get it done right. Give Tim a call.